An ETA Hack 50 woodchip gasification boiler with an automated feed and 1200ltr accumulator tank. 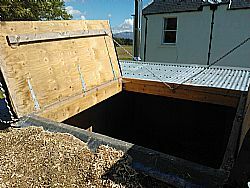 Waste wood from the Estate is chipped annually and stored in an open (but covered) unit. It is then transferred to a, purpose built, hopper by tractor (left). At the base of the hopper there is an agitator which spins and automatically adjusts to pull the chips onto a conveyor system (below). Once on the conveyor the chips are automatically fed into the boiler and burnt via gasification (wood is super heated in a low oxygen environment to create a gas (syngas) which burns at a far higher temperature than normal stoves or open fires). This heat is transferred to water via heat exchange. 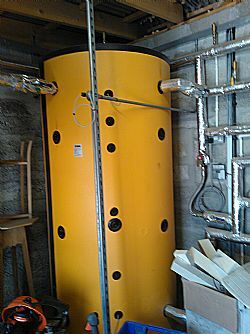 Hot water is provided to the house via radiators filled from the water (accumulator) tank. Its large size means that there is always hot water available and the boiler fires to keep the tank at a chosen temperature. The temperature of the water flowing around the radiators is determined by the outdoor temperature (colder outside temperatures mean higher heat to the radiators) providing more efficient use of the heated water. 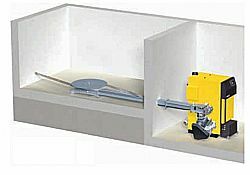 A separate draw of water from the main tank is fed to an internal water tank. The water in this tank is heated by the coils of hot water passing through it. 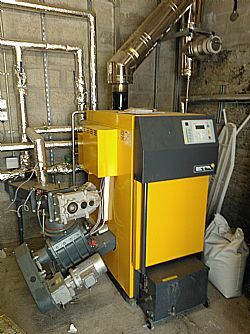 The boiler has an automatic fuel recognition device which adjusts fuel input and air supply depending on the energy density of the fuel- this means that a variety of species of wood and different moisture levels can be combined and burnt at the same time as the boiler will automatically adjust. The owner is unsure what the true cost of heating the house would have been prior to installation as the storage heaters only managed to keep the chill off the house and were simply too expensive to use. However, they estimate payback for the costs to be around 7 years. 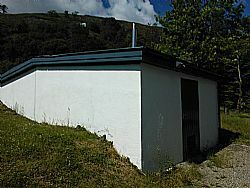 None, all within permitted development and HWE designed the system to suit the property. The automated de-ashing procedure makes quite a clunking sound (twice daily in winter) but this can be programmed to occur at times of the day when the noise will not bother anyone. The owner has a contract with HWE to come and service the boiler four times per year (£1000) and an arrangement with a local chipper to come and chip waste wood from the estate annually (£400). The owner feeds the hopper himself by dropping chips straight into a purpose built opening using his own machinery. The ash tray needs emptying manually but as this is just wood ash it makes a great fertilizer for the garden. Estimated electricity use for running the boiler, automated feed/ignition and pumps is £1000 annually. To feed the boiler they have discovered that soft woods seem to make better chips as they are less dusty and therefore tend fly away less when transporting and filling the hopper. With hindsight they might have built in some ventilation to the hopper (to prevent the chips from rotting) but as yet it doesn’t seem to have caused an issue. Additionally the opening hatch to the hopper is heavy and may not be suitable for less abled people. In general they are very pleased with the installation and have had no real concerns with it.